Stoke City have appointed Luton Town boss Nathan Jones as their new manager, after Gary Rowett's sacking on Tuesday. The Potters say they have agreed a compensation package with Luton, who are second in League One. Jones, 45, had been with the Hatters since January 2016 and guided them to promotion from League Two last season. "This is not a job for me, this is a lifestyle. The fans will see that," said Jones, whose new team are currently 14th in the Championship. "We will put a side out there that the club will be proud of. We will be hard working, talented side that will play in a certain way which we will work religiously on. "Along the way there will be some ups and downs, hopefully plenty of ups. But when we get our philosophy implemented and get working with the players, I'm sure they're going to respond." Stoke were among the pre-season favourites for promotion following relegation from the Premier League last term - and had appointed Rowett, 44, to guide them back at the first attempt. However, eight wins from 26 Championship games were not enough to keep the former Burton and Derby boss in the post, making him the third manager to leave the Potters in just over 12 months. Before Jones was appointed, Stoke had approached former Fulham boss Slavisa Jokanovic but he rejected the opportunity to be interviewed. "We have been following Nathan's career for some time and when we met him were hugely impressed with his clear vision as to how he will achieve success at Stoke," said chairman Peter Coates and vice-chairman John Coates in a joint statement. "Nathan is an incredibly driven and passionate individual and we are delighted to have secured his services for Stoke City." In their own statement, Luton said they "would like to thank him for his service and the passion he has shown for our club" and that an announcement regarding his replacement would be made "in due course". 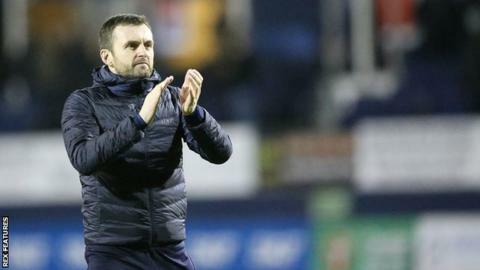 Welshman Jones enjoyed steady progress after taking the step from coach to manager with the Hatters, possessing a 51% win rate during his time in charge at Kenilworth Road. Having staved off relegation from League Two in his first season in the role, Luton are now among the promotion challengers for a return to the second tier for the first time since 2007. As a player he was a committed, versatile figure whose most notable spells came with Brighton and Yeovil - winning promotion with the former and captaining the latter in their 2007 play-off final defeat by Blackpool. His coaching development came alongside Terry Skiverton and Gary Johnson at Yeovil, while he also served on the staff with Oscar Garcia, Sami Hyypia and Chris Hughton at Brighton. Nathan Jones is a smart, intense, demanding manager - and one who is extremely ambitious. He plays slick, attacking, passing football, deploying a diamond formation in midfield. It results in goals - like last season, Luton have scored more than any other team in their division. He's known for being an excellent coach on the training ground and improves his players, while shipping out those he sees as 'passengers' or troublesome. Jones also develops exciting young players such as James Justin, Elliot Lee and Jack Stacey. He's relentless and passionate and his record at Luton was amazing and speaks for itself. His win ratio and points per game record was the best in the club's history. Stoke fans had been calling for Rowett's departure for weeks, with supporters frustrated by the style of football and poor results. Having recruited Tony Pulis, Mark Hughes, Paul Lambert and Rowett as their last four bosses, bringing in Jones represents a departure from the club's previous policy of having managers with plenty of experience. "That's a really left-field one," Martin Smith, the editor of the Oatcake fanzine, told BBC Radio Stoke's Praise and Grumble show before Jones' appointment was confirmed. "It shows the club are thinking a little bit differently and maybe building something and playing a more expansive style of football. "There are good managers out there in the lower leagues and they've got to get their chance sooner or later, or how else will they make their way up to the Premier League? "We just seem to have the Pardew, Allardyce, Moyes, O'Neill merry-go-round. Stoke are trying to do something different - but with three managers in 12 months, we have to get it right."